To build a shared and equal society, education is the first key step. Sikkuy aspires to a reality in which education for a shared society is a fundamental aspect of the educational agenda in the Israeli school system – in teacher training and continuing professional education, in pedagogical materials and the ways in which they reflect Israel’s diverse society , and in the study of Arabic in the Jewish state schools. The tense and divided reality in Israel, affected by the national conflict has a direct and negative impact on the educational discourse, atmosphere, and activity in schools. Among Jewish and Arab students alike, there are increasing levels of alienation, fear and hatred toward the other group. The teachers on the front lines of this situation often lack appropriate educational tools and training to address the feelings and attitudes articulated by the children or to prevent the growth of racist attitudes that represent a real danger to the fabric of society in Israel. Meanwhile, economic progress in the form of increasing integration of Arab citizens as an integral part of the labor force, and the integration of Arab students and faculty in academic institutions, are contributing to shrinking the separation between Jews and Arabs in many spheres. One potential outcome is that today’s school children could one day be adult citizens in a society in which the encounter between Arabs and Jews is part of everyday life. It is for this future that the school system in Israel must work hard to prepare its students, assuring that the worldview of both Jewish and Arab children does not revolve around fear and hatred but rather is oriented toward relating to one another as partners in a shared society. Teachers training: Sikkuy works with the Council on Higher Education to ensure that requirements for obtaining a teacher’s certificate will include courses that equip future teachers with the knowledge and tools to deal with a society plagued with rifts, notably the Jewish-Arab schism. We are also working on policy steps to ensure that working teachers, as part of their continuing professional education, will receive in-service training in shared society education. Pedagogical materials: Sikkuy is aiming to include criterion of appropriate representation of the broad diversity of Israeli society, particularly including Arab society as a factor in the Education Ministry’s evaluation and approval of textbooks. Ministry approval for this approach will ensure that the various textbooks in all the subjects taught in the state school system will include equal and respectful representation of Arab citizens of Israel, and will exclude negative and insulting stereotypes about Arab society. Arabic studies in the Jewish school system: Sikkuy believes that the study of Arabic in the Jewish school system (both the state secular schools, and the state religious schools) can provide a solid basis for life in a shared society. Students in the Arab school system already learn Hebrew beginning in the third grade, and the study of Arabic should likewise be compulsory in Jewish schools, with official emphasis and support (as a preferred subject) from the Education Ministry. On the political front, there is a rare consensus as to the importance of this issue, although there is still a vast gap between rhetoric and policy in practice. Moving forward, Sikkuy is closely examining the current relevant policies and assessing the barriers to a broader study of Arabic, as the basis for drafting policy recommendations for the Ministry of Education. 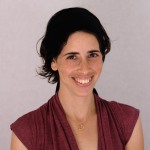 Yaala Mazor joined Sikkuy in 2014 as the coordinator of the Equality Zones project; today she coordinates different projects in the “Joint Society” department. Yaala has a second degree in Society and Arts studies. In addition to her work in Sikkuy, Yaala facilitates groups on social change, human rights and Jewish-Palestinian encounters groups. Yaala is a member of Kibutz Hannaton, where she lives with her partner and three children.